If you remember from Part 1: Trees and Part 2: Shrubs, we're highlighting Wisconsin native plants that have a bad reputation as "weed plants" or that they are aggressive. 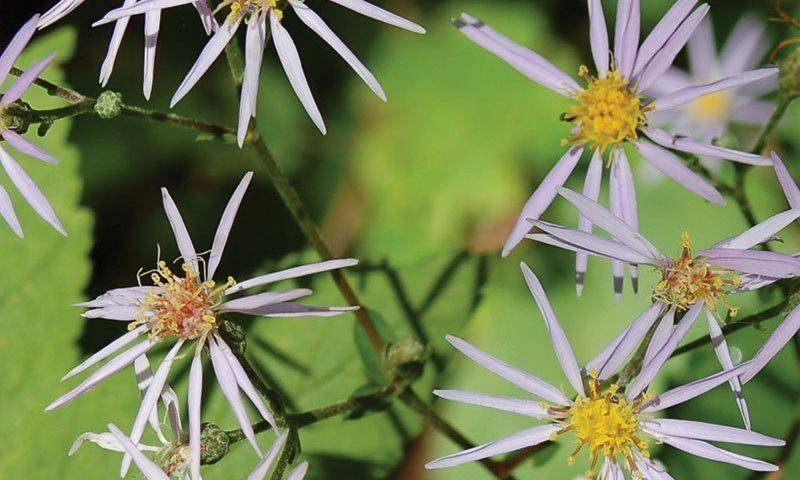 Sometimes the aggressive nature, or undesirable traits, can be an asset rather than a nuisance in your landscape, though some of them have been classified as "weedy" by many professionals, and thus are "naughty natives". And like certain trees and shrubs, perennials are often classified as weeds. The following perennials should be considered in situations where their aggressive natures are an asset rather than an annoyance. Whilst trekking through a ravine with my co-workers, it was noted that the forest floor overlooking the ravines was covered in a carpet-like layer of rough leaves. In some places it covered the ground completely, but usually appeared to be interspersed among the sedges and forest floor perennials common in southeast Wisconsin. Bigleaf Aster wasn't bothered at all by the dry, shady conditions. It was thriving. For many homeowners, the issue of dry shade comes up often. There are few plants that can survive in a world with minimal light and water, and even fewer native ones. Typically, garden perennials like moist well drained soil with a few or more hours of direct sunlight. It is always nice to find wild solutions to (sub)urban problems. Some plants that can survive dry shade are Bishop's Cap (Epimedium), Bottlebrush grass (Hystrix), and Bigleaf Aster. 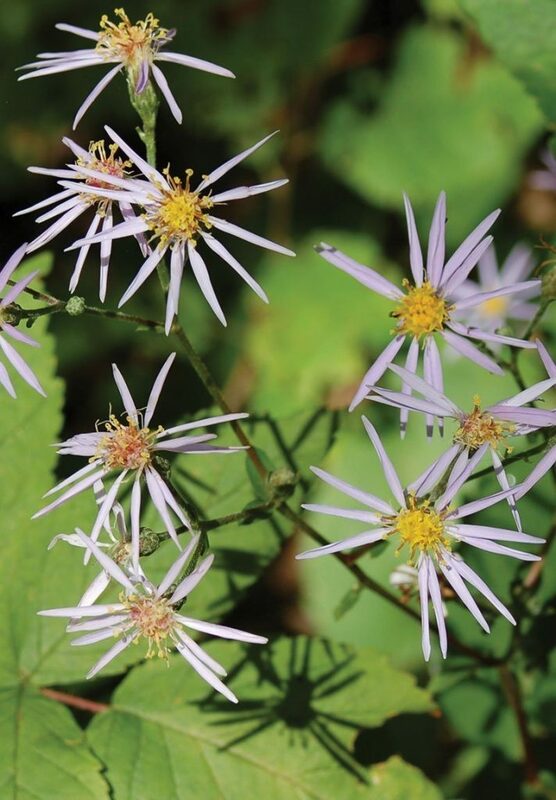 Bigleaf Aster is coarse and beautiful, with large, bulky leaves. It has a propensity to run underground and form large colonies. In richer soils it seems to bolt rapidly and flop over, so keep it on a lean diet. In late summer it has beautiful blueish-white flowers that stick up from the leaf carpet. The flowers are held aloft in the way many asters do, well above the crown with few leaves on the stem that appear as though they are floating at a distance. Flower color seems to depend largely on genes and potentially on soil conditions. When I have picked off "blue" flowered plants in the wild and grown them in a container, the flowers seemed to go more towards the white side. I rarely see Bigleaf Aster utilized in the dry shade situations, but, then again, not many nurseries are growing this plant. It's for sale now at Johnson's Nursery as a native and maybe with a little trial and error, it can be applied to a shady, dry landscape with a little more commonality. Rotund, shining leaves! Tall yellow flower spikes! A love for shaded areas with ample water. Sound familiar? Related distantly to the garden-friendly Ligularia, Golden ragwort is a nifty native. Packera has some drawbacks. While that fancy-pants Ligularia tends to stay put - only spreading slowly from year to year - Packera aurea flies out of its pot and into the surrounding soil at a rate that would shame most colonizing perennials. It appears it spreads faster in looser or richer soils. In my own back yard it spread nearly a foot in all directions from a #2 pot - resulting in a 3' by 3' circle colony. Now this might sound aggressive to some, especially folks with small yards with precious little space. To others it may be just what nature had in mind. Plus it's called PACKERa, and it's green and gold like a team I love. Here's hoping the Packers are as aggressive this football season as their native namesake. Named for its milky white sap, there seems to be a milkweed for every scenario. I'm currently experimenting with a few of the unusual suspects at the nursery: Whorled milkweed (Asclepias verticillata), a small dainty relative, and Poke Milkweed (Asclepias exaltata), a shade-tolerant species. Johnson's Nursery carries Swamp Milkweed and Butterfly Weed (Asclepias incarnata and A. tuberosa, respectively), as these are the most garden-friendly species. One of the more common milkweeds is the Common Milkweed (go figure). It's more noteworthy aspects include the large round clusters of pinky-purple flowers butted up against dark blue-green leathery leaves. Once pollinated, the flowers turn into great, oblong, 'nodulated' pods which house the most ethereal silver silken threads ever produced by nature. Attached to the beautiful fan of fine filaments is a flat little brown seed, which expects a fair wind to come along and carry it to a different pasture or railroad cut than where it was conceived. This plant has broad spectrum appeal and can amaze children and elected officials alike. This plant is more American than apple pie. My grandmother told tales of World War II era policies where they could collect the pods in a big sack and get paid a bit for assisting the war effort. (Something like $ 0.15 per bag). The silk in the pods was used for stuffing in flotation devices. More recently there has been concern over the decreasing population of Monarch butterflies, who travel over great distances and several generations from Mexican mountain valleys to the breadth of the United States. The larval stage is completely dependent on various milkweed species. I like Monarch butterflies as much as the next guy. Who wouldn't want to support them? They face habitat loss and the varied pressures of industrial agriculture. So plant folks out there are really pushing the milkweeds these days. I've seen seed packets with 50 count seeds in them handed out as bookmarks! If you get one in fifty to grow, you'll have more than you need for the average suburban lot. If you have a couple acres - that's a different tale. Common Milkweed gets pretty tall, 3-6 feet, and can cover quite a few square feet. They seed prolifically as well, so they also may appear in neighbors flower beds or foundation plantings. This milkweed needs full sun to thrive, though they can survive in light shade if other conditions are optimal. They tolerate a wide range of soil conditions, but don't like wet feet (though it's cousin the swamp milkweed - Asclepias incarnata - does well). It is a wide-ranging species found from the Great Plains all the way into Maine and as far south as northern Georgia, wherever Monarchs travel on their journey. I hear so many native gardeners tell me that Cup Plant was their first big mistake. It's a great plant - REALLY! It has yellow, sunflower-esque floral displays, it holds water in its leaf bases, and makes little seeds that are relished by birds. It attracts pollinators, tiny frogs, birds, a host of other visiting insects and it's beautiful. What else would you want to plant? But...someone didn't tell you the whole story. This plant is big. And it wants a lot of room. It's 10 feet tall. That's right - in a few short years the tiny little plant you bought will be somewhere between 6-10 feet high. That's big. It could be dropping seeds in your gutters if you site it incorrectly. It seeds readily - so your colony will soon be a spreading beast if not kept in check annually. It's often planted in richer soil than it's accustomed to - so it becomes ponderously heavy. This means by the end of a July rain - it's often flopped over on the ground, unable to support its own weight. Cup Plant is perfectly suited out amongst its tallgrass prairie compatriots. Held up by a lean diet and tall friends, it looks great. Any other spot - planter be warned. My wife planted one in our garden about 2 years back. From a 1' tall seedling it has grown to be the same scale as a 6' lilac right next to it. It actually does a pretty good job screening out the sidewalk behind it. This year it got a little floppy so I think I'm going to deadhead it when it is done flowering. There was a plethora of bees about it when it was flowering. Birds hang out in and around it for the bugs it attracts as well as the water it holds. We will see what it does next year, but so far it is proof that Cup Plant can work if sited correctly. As the Naughty Natives series comes to a close - I have thought on the title to some extent. Being 'naughty' implies misbehavior, like a poorly trained dog or a disruptive child. These plants we've discussed are not naughty. They are merely doing what they would be doing in a natural scenario. These plants are natives. They are not domestic. They are wild. They never once considered that humans would try to contain the world into little plans and borders, with a fence line here, a lot line back there, and a little island bed over yonder. We have to 'think' like them. Like they want to fill space, fight for dominance, reproduce! When we want a plant for our gardens, we must consider the nature of the beast. We've learned to consider our pets carefully. Just like a wolf is not a dog. A lion is not a cat. A cup plant won't guess or care where your garden ends, but prowl through the landscape like a certain Milwaukee Lion.